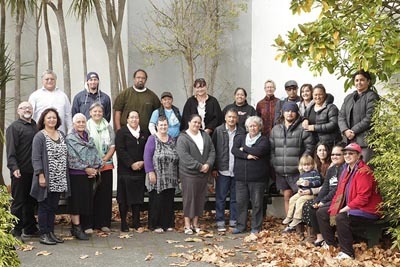 Nga Tai o Te Awa offices in Whanganui on 9 and 10 May were the venue for a double workshop for Whanganui iwi facilitated by National Services Te Paerangi. The workshop’s two kaupapa were the very popular digital photography for iwi and paper conservation for iwi. The workshop was a collaboration between National Services Te Paerangi, Nga Tai o te Awa iwi organisation, Whanganui River Māori Trust Board, Alexander Turnbull Library, and Wanganui District Council. In a survey taken in 2009, iwi from around the country requested digital photography training. They recognised the importance of keeping records of photographs of ancestors and other precious taonga held on marae and within private homes in case of tragedy like fire or flood. The very experienced Te Papa photographer Norm Heke tutored the digital photography component of the workshop. Norm covered topics such as practical lessons using your own camera and collections of photographs, group composition, use of natural light, taking high quality images of existing photographs, and how to get the most out of your camera. It was a hands-on workshop and absorbing kaupapa. Another experienced practitioner, Field Conservator Vicki-Anne Heikell of the National Preservation Office, Alexander Turnbull Library, tutored the paper conservation component of the workshop. Vicki-Anne touched on the history of paper making, and showed how to care for and store paper works and photographs in your own home, or for your marae, whānau, hapū or iwi. Vicki-Anne worked with whānau on their treasured journals, diaries, manuscripts, and other paper taonga. There were also some very old church pendants, and Vicki-Anne demonstrated the correct techniques and proper methods used for storing these types of taonga. This workshop had a great spread of participants from the different Whanganui River hapū, as well as some from further afield who had come to check out the 2-day course with a view to perhaps bringing the workshops to their own rohe (area). These practical workshops are interesting, popular, and give whānau a chance to gain an insight into the types of expertise and training available. The workshops also raise awareness and though the hands-on teaching give practical skills that participants can demonstrate to their own whānau. I would like to thank Whanganui leader and kaumātua for Nga Tai o Te Awa John Maihi, and Office Manager Evelyn Hiri, for hosting the workshop. I would also like to thank Sandy Nipia for thinking outside the square and tying in the different iwi dynamics. Finally, thanks to Sheena Maru and Che Wilson, who for several years now have been in support of this planned workshop. I’d also like to thank Puawai and Arahi Hagger from the Ratana Church Archives. Puawai and Arahi brought some students to the workshop, allowing them to gain practical experience in the fine art of measuring, cutting, folding, and boxing precious paper taonga and journals from the Ratana Church Archives collections. From our team to everyone who attended and made this workshop such a success – thank you very much.